In January, 1993, we lived in Texas, and had done so for four years, long enough to know people. My friend Sue had heard from a friend that the Presidential helicopter landing at Ellington Airforce Base would be open to the public. President Bush had not wanted anyone to make a fuss, but members of his family wanted someone to be there. The President was someone I had found off-putting, though I prayed for him as I have for the rest of them before and since. But I had felt, at the time, that Barbara Bush and I lived in somewhat parallel universes. We both had attended women’s colleges, and we were both married to men who couldn’t tell us everything by virtue of their jobs. Her husband had headed the CIA before becoming President. Mine worked in aerospace with a security clearance before becoming a priest in the Russian Orthodox Church. We both were expected to be well dressed and diplomatic in our choice of words, and both of us struggled with it. Well, and I wanted my children to see a President, and this might be our only chance, and frankly, they would be just as excited by the chance to leave school early and see a helicopter. We were not supposed to mention to the school where we were going, because political events were not excused absences, and this was considered political. I did not consider it so. I considered it humanitarian. The man had lost an election in front of God and everyone, and he was coming home changed. Attention must be paid. So I had sent in a note saying the older children had an “appointment,” and the secretary smiled, as she signed us out from Kindergarten and First Grade. “Lots of families signing out. Are you going where I think?” she asked. I smiled and raised my eyebrows. “Wave for me, too,” she said. Secrets live about as long as ice cream, down in Texas. You have to drive down Highway Three to get to the airport. One side of the highway was railroad tracks. The other side were the sort of businesses I had never seen in Boston — bait and gun shops, pawn shops, and the sporadic bodega, which in Boston would have been called a “spa.” There was nothing along the road to indicate that anything special was happening, as befits a former head of a spy agency returning home on a day that is not his. But when we turned into the parking lot, there were people with signs, buttons, and flags. Our children were given some, which I kept for twenty or more years before losing them in a decluttering binge. I was so homesick during those years. 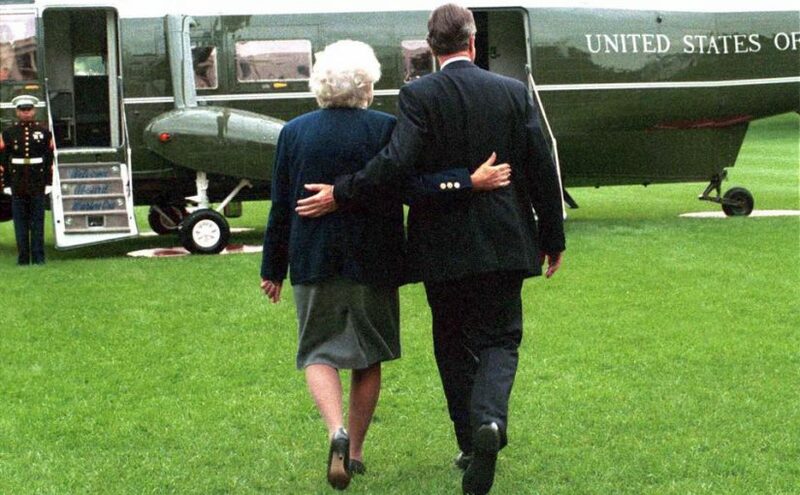 I had thought of Barbara Bush alone with her family in Midland, as I was far from our relatives in Michigan and Boston. 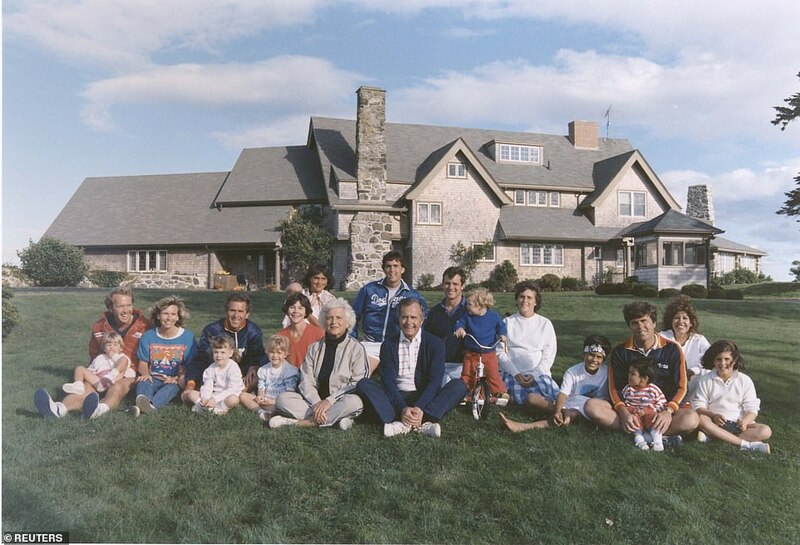 I had seen the family photos of Kennebunkport, and thought, “Barbara Bush lived in Texas and did what she was supposed to and was able to move to New England,” and thought perhaps I might to do the same. But in the end, Texas had become home to them. I went to a meeting, years later, in the “hotel” they called home, and it reminded me of the older Wellesley dorms, with nicely appointed common rooms lined with books. “If you don’t have family when you move to Houston, you make family,” my brother-in-law had told me when we moved there in 1989. He was right. My generous sister-in-law had shared their friends with me, I met mothers through Mothers Day Out and school, we had parishioners and neighbors. People were smart, kind, funny, generous, helpful, and welcoming. I was busy and had a life. I even wrote, and had sold an article to a magazine in California. But sometimes I sniffed the air for a salt breeze, and there was none. I missed lilacs and lily-of-the-valley, and I wanted more than anything to have tea with milk with my grandmother. And I wondered if Mrs. Bush had done the same. I held my son on my shoulder and people moved so my daughter could see. The first people to emerge from the helicopter were the secret service officers, all impeccably dressed in crisp black suits with matching sun glasses. They had wires in their ears and were communicating to each other. The former President’s tall sons stepped out, looking young and dazed. More relatives emerged, then Mrs. Bush, then George Herbert Walker. Someone had set up a microphone, and President Bush was led to it. “Well, now I know how little influence I have!” he said, “I said I didn’t want anyone to come, and now I see how well y’all listen!” But his smile was both warm and grateful, and I was glad the children had seen it. He was a wartime president, and my children had been folded into the war effort. My daughter had been sending care packages to the soldiers she’s met through the “any soldier” program, now defunct. She felt very much a part of the effort as she set aside artwork and chose bags of candy to send them. Both children had learned the words to “I’m Proud to Be an American” at school, and yellow ribbons and American flags had been a large part of the backdrop of their childhood. He had engaged the public, and had hired a speech writer, Peggy Noonan, whose style I had admired even before she coined the phrase “kinder, gentler.” I felt that even Clinton’s victory had been a result of the empowerment and involvement of the individual that had been part of the culture of that presidency. I wanted, too, for my children to see how to lose gracefully, how to walk away from something knowing that you were walking to something else. The newspapers reported the President had bought a fishing license while he was home on election day. He had been away for twelve years. He looked relieved to have landed. There were cheers, and handshakes, politically connected people greeting each other and the rest of us starting to walk toward our cars. Someone has been waiting for you. Beautifully written, Ann! Thank you. I am glad you enjoyed it! I have always been glad that we made the effort to do this. Really moving and very touching. Such a great juxtaposition of the very public and the most private and personal in an event. Thank you for this! I so enjoy reading your stories! What a wonderful way to remember your history. I so enjoy your stories. So moving! Beautiful Ann. I’m sure Mr. Bush and his family deeply appreciated having you and your family there. I thought there should be children in the crowd. Children with flags make everything better.